As residents in the Oklahoma City area grappled with the aftermath of the massive tornado that wiped out homes and businesses in its 20-mile path of destruction, killing at least 24 people, relief organizations solicited donations to help. By and large, the charities expressed a preference for donations of money rather than goods. Monica Diaz of the Red Cross in Los Angeles said donating money "allows us to get the items that are needed the quickest faster." Donations to the Red Cross will be added to the organization's disaster relief fund, a pot used for disaster aid across the country, not just for the Oklahoma tornadoes. The Red Cross opened one shelter in Moore, Okla., and three in Oklahoma City, and sent dozens of emergency response vehicles to the stricken area early Tuesday. Donations came be made on the Red Cross' website, redcross.org; by phone, (800) RED-CROSS; or by texting "REDCROSS" to 90999, which will make a donation of $10 by way of the donor's phone bill. The Salvation Army is providing support to tornado victims and first responders, with several canteens, or response units, opened in the region. Donations can be made online at SalvationArmyUSA.org; by calling (800) SAL-ARMY; or by texting "STORM" to 80888, which will make a $10 donation. Checks can be mailed to: The Salvation Army, P.O. Box 12600, Oklahoma City, OK 73157. According to the Salvation Army, a donation of $10 can feed a disaster survivor for a day; $100 can serve snacks and drinks to 125 people at a disaster scene; and $500 can keep a canteen operational for a day. 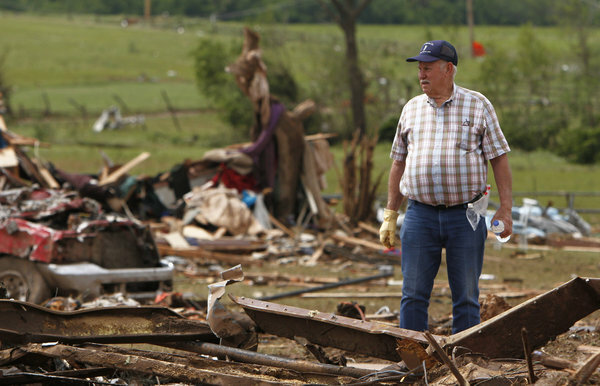 "The devastation is far-reaching in both human life, property and livestock loss," Maj. Steve Morris, Salvation Army divisional commander for Arkansas and Oklahoma, said in a statement. "Many of these impacted communities will take months or even years to recover. The Salvation Army is committed to being there with them throughout and providing aid wherever it's needed." A local organization, the Oklahoma City Tornado Recovery Fund and Community Emergency Fund, is also accepting donations to help with intermediate and long-term recovery. That fund, established by the Oklahoma City Community Foundation in the aftermath of the devastating May 3, 1999, tornado, said it will donate 100% of the donations it receives to those affected by the storm. Those donations can be sent to the Oklahoma City Community Foundation, P.O. Box 1146, Oklahoma City, OK 73101-1146, or can be made at www.occf.org/tornadorecoveryfund. If you would like to help children in need receive a quality, life-changing education, please visit our website to donate or volunteer. Thanks!